Gajar-Mooli Paratha, or carrot and radish stuffed flatbreads are a delicious way to serve veggies effortlessly. 2 cups durum wheat flour (can use whole-wheat instead). Add 1/2 tsp salt and 1 tsp canola oil and knead with just enough water to form a stiff but pliable dough. Sprinkle about 1/2 tsp salt on the carrots and radish, put into a colander, and leave for around an hour for the water to express from the vegetables. This step is very important, otherwise your parathas will become a gooey mess when you try to roll them out. Squeeze out all the water you possible can from the vegetables. Add chaat masala, turmeric, chili powder, kasoori methi and salt. Divide the dough into balls, each about 1 inch in diameter. On a floured surface, roll out each ball into a circle around 3 inches in diameter. Place 2 tbsp of stuffing in the center. Roll out another circle of the same size, moisten the edges with water, and place over the circle with the stuffing. Press down on the edges to seal. Flour the surface and roll out the paratha, turning often and adding more flour if necessary, to prevent sticking. When it's around 7 inches in diameter, you can transfer it to a hot cast-iron griddle on medium heat. 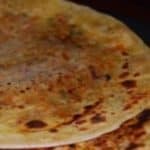 Roast each side for about 2-3 minutes, coating with a few scant drops of oil, until brown spots appear evenly on the surface of the paratha. Serve hot with chutney or pickle or any spicy curry of your choice.